An Apple invention published on Thursday illustrates a simple yet effective way to remind a user of who is on the other end of a text message or group chat, a problem that is the bane of people who juggle multiple conversations at once. 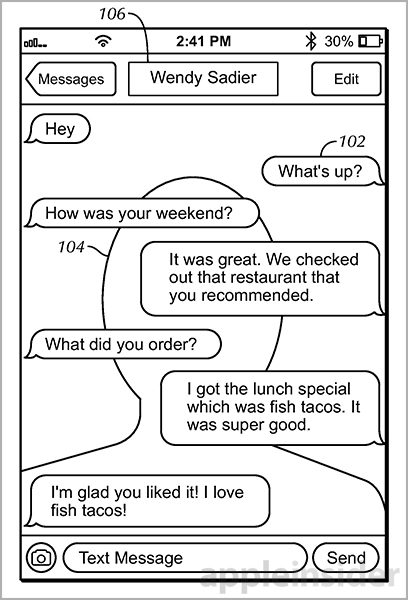 As published by the U.S. Patent and Trademark Office, Apple's patent application for "Generation of a user interface based on contacts" enables users of apps like iMessage to be more aware of who they are talking to at any given time, thereby preventing potentially embarrassing misdirected messages. 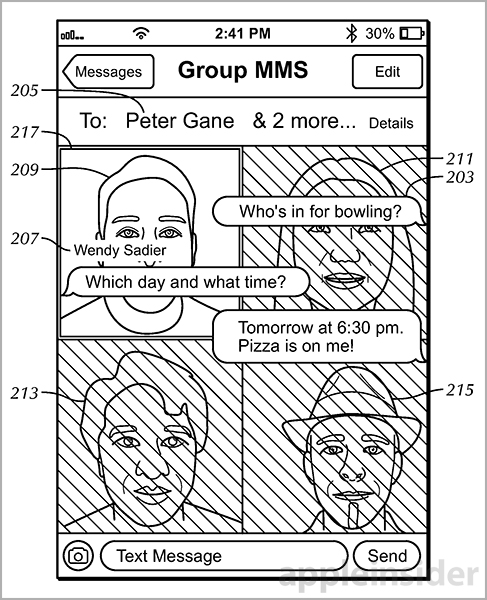 The invention basically inserts a contact's picture, or photo corresponding to a contact, as the background image for a messaging session. For group chats, text is overlaid atop one or more images relating to the contacts involved in the conversation. 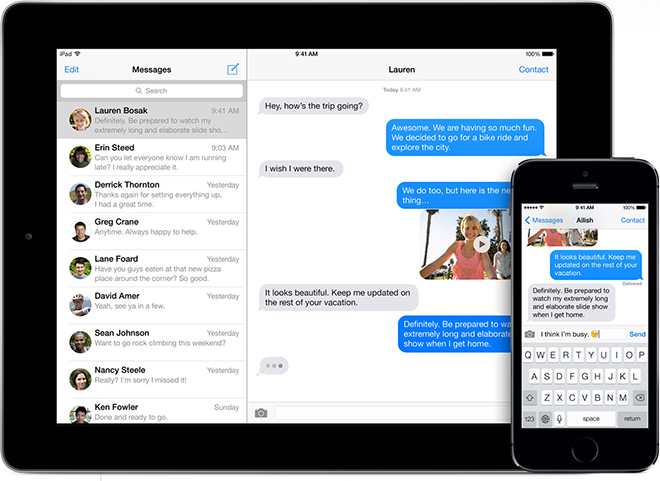 In practice, the system recognizes that a user has received or is about to send an iMessage, email, MMS chat or similar correspondence, then identifies contacts associated with that message. A background image relating to the contact or contacts is then used to create a background on which the conversation will take place. When a contact does not have an assigned photo, a generic male or female avatar may be used as the system intelligently selects gender based on stored contact information. After an appropriate image is selected, a background can be generated by enlarging, stretching, cropping, tiling or otherwise adjusting the picture to fit the messaging screen's size. Further modifications like alpha-blending and desaturation blend the image into the background, allowing the user to focus on the active conversation text, which includes the usual names, time stamps and other familiar UI assets. The ability to dynamically modify background imagery is especially useful in group chats. For example, a box can highlight the image associated with the user who sent the most recent response. Alternatively, a selected image can be displayed in color while the other participants are shown in greyscale, thus denoting who sent the last message. Other variations on group messaging include image thumbnails arranged in a Cover Flow style, a rotating carousel or contact cards with animated transitions. The remainder of Apple's filing dives deeper into system implementation, including discussion of an API that would potentially open the door for third party apps to access the technology. Apple's image-based messaging UI patent application was first filed for in 2012 and credits Enrique E. Rodriguez as its inventor.